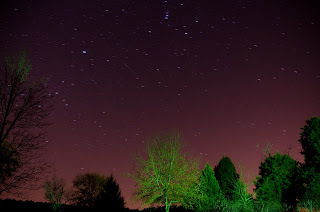 Two nights ago I saw how beautiful the stars were and I decided to go out in the freezing cold to photograph them. The photograph below was my favorite from the whole night, and it was worth my fingers going numb. The exposure was about a minute and fifteen seconds, and in the last five seconds of the exposure, a shooting star (or flaring gas, whichever the two) shined across. You can see it in the middle of the frame. This is my first photographed shooting star, and I'll cherish it forever.